and members of the Red Hat Society. © 2018 Iliffe Media Publishing Ltd. All rights reserved. 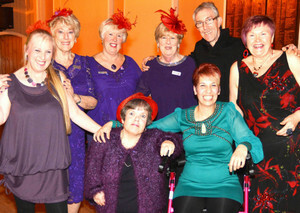 Supporters who twirled the evening away during a Valentine dance at the Heacham public hall on Saturday night fulfilled a dream for the event’s organiser. When Nikki Hastie was diagnosed with Myalgic Encephalomyelitis, known as Chronic Fatigue Syndrome or ME, it forced her to close her successful business cleaning properties including second homes and holiday lets. But now, she is working with others in a similar situation and the event fulfilled her ambition to do something to help people like her.